WYDOT chose to focus its CV pilot on freight traffic safety and awareness along I-80, the major corridor for east-west freight traffic for the northwest U.S.
Much discussion has surrounded connected and autonomous vehicles in the media over the past few years, yet only recently have pilot deployments of such technologies begun. To help spur adoption and implementation of connected vehicle technology, the U.S. DOT selected three pilot sites to implement connected vehicle technology. In 2015, the U.S. DOT selected Wyoming as one of those three sites in the country to design, build and test phases for a regional Connected Vehicle (CV) Pilot Deployment Program. The CV Pilot Program, sponsored by the U.S. DOT Intelligent Transportation Systems Joint Program Office, aims to use connected vehicle technology to improve safety, increase freight efficiency and reduce environmental impacts of personal driving. Wyoming’s interest in connected vehicle technology stems from the goal of improving driver safety and awareness along Wyoming’s I-80 corridor that extends over 400 miles and traverses through extreme winds and harsh weather conditions. Wyoming’s pilot is all about big trucks and severe weather. Both are plentiful in Wyoming, and they do not play well together. Wyoming’s position along the I-80 corridor makes it a crucial artery for freight traffic, and its unique recreational opportunities draw a significant number of visitors to regions of the state that skirt the interstate. Interstates 80, 90 and 25 serve a critical role in the movement of goods across the country and between the U.S., Canada and Mexico. 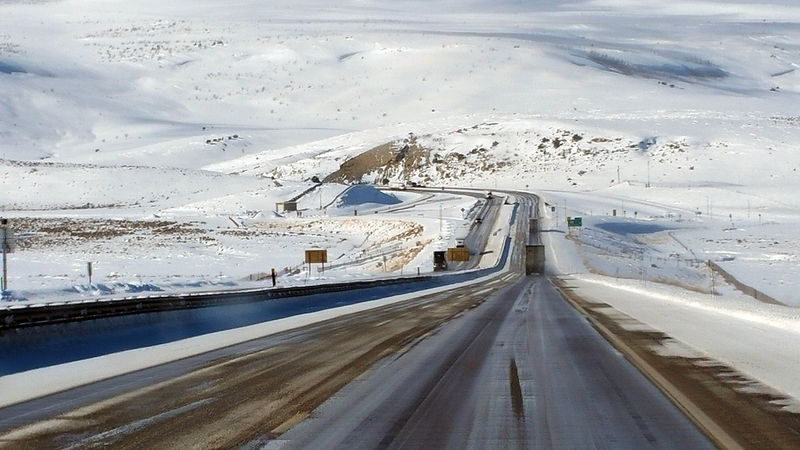 I-80 in southern Wyoming serves as the major corridor for east-west freight traffic for the northwest U.S.
At an elevation of 8,640 ft above sea level, Sherman Hill Summit, between Cheyenne and Laramie, is the highest point along the entirety of I-80. Furthermore, the average elevation of I-80 in Wyoming is more than 6,000 ft. This high altitude along with topography that causes wind to flow relentlessly through the I-80 corridor between the central Rockies can make for very frequent snow-covered road surfaces, poor visibility from fog and blowing snow, and extreme wind events. With winter weather events extending from September to June, the state of Wyoming has an extended winter driving season. This, paired with long stretches of road with no service points and limited parking, can make for high frequencies of exposure to extreme winter conditions for travelers along the corridor. Consequently, freight drivers are more likely to be exposed to the challenges associated with surface travel, such as frequent road closures, long distances between service centers, reduced availability of truck parking and lack of alternative routes. The state of Wyoming has an extended winter driving season. Due to the challenges imposed by Wyoming’s winter travel conditions and commensurately high incident rates, the Wyoming Department of Transportation (WYDOT) chose to focus its CV pilot on freight traffic safety and awareness along the I-80 corridor. The goal is to reduce the number of multi-vehicle crashes and road closures that occur, as well as provide travelers with more information on road conditions, parking availability and situational awareness. To meet these goals, WYDOT engaged the Wyoming Highway Patrol, Wyoming Trucking Association, Commercial Vehicle Carriers and other concerned parties. Together these stakeholders discussed how connected vehicle technology could benefit them and which applications would decrease incident rates or reduce road condition pain points. From these stakeholder engagements, WYDOT chose to deploy Forward Collision Warning, Work-Zone Warning, Situational Awareness, Spot Weather Impact Warning and Distress Notification applications. These applications focus on driver awareness of road conditions and imminent collision avoidance. The Forward Collision Warning application (as shown in Figure 1) warns trailing vehicles of imminent collisions with other connected vehicles. Situational Awareness and Spot Weather Impact Warning both alert drivers of upcoming hazards and allow drivers to take precautions. These hazards and information may include updates to variable speed limit zones, weather and road condition updates, and parking information. This information will be delivered to connected vehicles via dedicated short-range communication (DSRC) radios installed along the roadside, as well as through satellite communication. These DSRC radios allow high-speed communication amongst vehicles as well as from infrastructure. Additionally, the WYDOT pilot project will gather environmental data from WYDOT snow plows. This data provides atmospheric and road condition information. This information is utilized by a forecasting system known as Pikalert and will allow WYDOT to more accurately issue weather alerts and forecast information to travelers of the I-80 corridor. Work Zone Warnings also can be issued by the WYDOT Traffic Management Center (TMC) and will similarly alert drivers to conditions about upcoming work zones. This application will make work zones along the I-80 corridor safer for drivers and construction workers. The final application that will be deployed is a Distress Notification application. This application allows drivers to send distress notifications if their vehicle is disabled or if emergency services are required. Other connected vehicles in the vicinity of the vehicle in distress will be able to receive the notification and will then re-broadcast the distressed vehicle’s location to other nearby vehicles and the nearest roadside radios, where it can be sent to the TMC and emergency responders. Figure 1. This application warns trailing vehicles of imminent collisions. For the past year WYDOT, along with a multidisciplinary team that includes Trihydro Corp., ICF International, the University of Wyoming, the National Center for Atmospheric Research, Vital Assurance and McFarland Management, have been developing these applications for deployment by the end of March 2018. Figure 2 maps via diagram the architectural organization of Wyoming’s overall Connected Vehicle Pilot plan. This diagram can be overwhelming, but it simply represents how the system will be built, along with the communication paths to the different components. The right side of the figure represents the different types of vehicles involved in the pilot. The left side represents applications (both internal and external) that will be integrated into the CV environment. The bulk of the data flow is represented by the application in the center of the diagram with incoming and outgoing messages flowing through the Operational Data Environment application. The system is complex, with many data streams flowing into the system where messages are developed and refined and then delivered to connected infrastructure and, ultimately, connected vehicles. During the test period, which will launch in April 2018 and run through May 2019, 75 roadside units and 400 vehicles will receive and report CV messages. 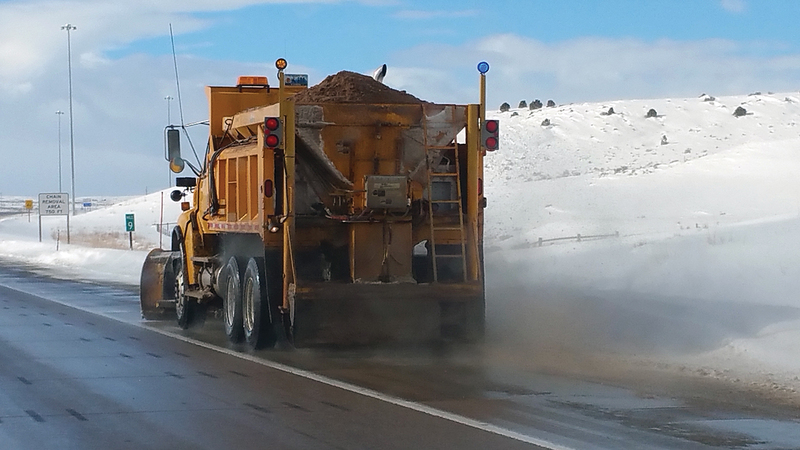 WYDOT outfitted and deployed over 90 snowplows in its fleet with CV technology in mid-November 2017. This rollout will allow time to test and refine the system during typical winter conditions prior to the start of the formal testing in April 2018. These snowplows, outfitted with environmental sensors, will be key to the success of the project, and are expected to enhance the quality and quantity of environmental data that the TMC receives on road conditions. This data will trigger actionable alerts and warnings for the TMC operators, giving them better information for decisions on road closures, reducing speed limits and notifying drivers of upcoming road conditions. Connected vehicle messaging will be available to the general public through the Wyoming 511 app (compatible with Android and iOS devices), the Wyoroad.info website and WYDOT’s commercial vehicle operator portal website (https://apps.wyoroad.info/cvop/). These sources will allow the public and freight operators to see the benefits of the CV data without having to be in an equipped connected vehicle. Figure 2. The architectural organization of WYDOT’s program. To date the Wyoming pilot team has spent more than two years designing and building the Wyoming CV environment. The team is excited about the prospect of rolling out a fully functional system; however, because CV technology deployment is so new, development has come with all of the pitfalls of a cutting-edge system. Implementing CV technology into an existing TMC environment is a major undertaking, and even with access to lessons learned by the U.S. DOT’s pilot programs, new implementers of this exciting and beneficial technology should take into account the time, planning and patience that new technologies require. In particular, the Wyoming pilot has had to rethink the way that traveler information messages (TIMs) are broadcast along the corridor. Updating TIM messages requires the ability to track existing TIM messages and update them or remove them when necessary. This ability to track, update and remove TIM messages had to be built from the ground up. Additionally, TIM messages needed to be limited to road segments that correlate to mileposts. For this to be implemented correctly the CV system had to tap into WYDOT’s road database to determine the latitude, longitude and heading (in decimal degrees) for every 1/20 of a mile road segment. This then allows the CV system to broadcast a TIM for connected vehicles to receive and notify drivers when they enter a region corresponding to the TIM. Another application that has taken a bit of work in order to integrate with WYDOT’s backend systems is the Distress Notification application. This application requires the TMC to be notified immediately when a distress notification is received. This requires a notification to a TMC application that operators use for incident management, but also tracking the distress notification within the system so that the same distress message is not sent multiple times to the TMC, which may overwhelm the operator and spam the incident-management application. For additional information about the project, visit the new WYDOT CV Pilot Program’s website (https://wydotcvp.wyoroad.info). Zumpf is a software development engineer with Trihydro Corp.